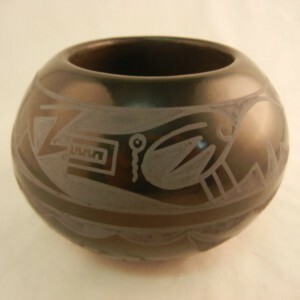 At Palms Trading Company, we offer beautiful pieces of art from Native American Indian artisans. Many of these pieces of art are hand-crafted using techniques passed down through generations, just like the techniques used to create the heishi beads. Heishi (hee shee) beads were being made long before the introduction of silversmithing and metalwork by the Europeans. The word heishi means “shell necklace” in the Keres language spoken in Kewa Pueblo. It refers specifically to single or multi-strand necklaces of pieces of shell that were ground into beads and strung. The ancient Pueblo peoples obtained their shells through extensive trade networks that extended from the Gulf of California down to South America. Turquoise can be used to make the beads; however the stone is difficult to work with, so it is rarely used. True heishi bead jewelry is hand-made from beginning to end by skilled artisans in a labor-intensive process. The process begins when the artisan snips small, rough squares off of a strip of material. He or she carefully drills a small hole into the center of each square, then strings the squares onto fine wire. The next step it to shape the string of beads. The artisan moves the string repeatedly against a turning stone or grinding wheel, using his or her hands to control the shape and diameter of the beads. Different materials require different shaping techniques. Pipestone, for example, can be ground down much faster than a harder material like lapis. Once the string is ground and shaped, the artisan further shapes and smoothes the beads on a sanding wheel with increasingly finer grades of sandpaper. The last step is to wash and air dry the beads before polishing them with wax on a leather turning belt. The beads are then strung to create the finished piece of jewelry. They can be strung in a combination of colors to create patterns, on multiple strings to make a multi-strand piece of jewelry, or strung with other types of beads. The finished product is a beautiful, unique piece of hand-made jewelry. You can see and purchase these exquisite pieces our store and online!